Just finished reading this remarkable novel. Set in the immediate years after World War II, this book, a book of letters, features a writer's growing interest in the people of Guernsey Island (Channel Islands off the coast of France) and the German Occupation of the island during the war. This is a book reader's dream book.....reminiscent of 84 Charing Cross Road by Helene Hanff, one of my favorite books ever (also one of my favorite movies ever....one rare example where the book and movie are equally excellent...see more on post above). I was very impressed that the authors of the book were able to write such an epic story in such a relatively small book. And I also was impressed with the delicate balance of sadness (concentration camp stories) and joy. The protagonist of the book, Juliet Ashton, is a London-based writer who receives a letter from a stranger who lives on Guernsey Island. Ashton was the author of a popular wartime column and the stranger writes to her for advice on books by Charles Lamb. In his letter, he introduces The Guernsey Literary and Potato Peel Pie Society of which he is a member. Ashton becomes intrigued with the Society which was formed as an alibi for its founding members to prevent the German's from punishing them for exceeding curfew hours following a surreptitious feast of roast pork, a prohibited delicacy for the islanders. The Society, which is really a reading group, then becomes a welcome escape from the harsh realities of Guernsey Island during the German occupation. Ashton begins to correspond with members of the group and also other citizens of Guernsey and the correspondence ends up bringing the author to the island to research and write a book. In its brief 288 pages this book takes us through the bombings of London, the occupation of the Channel Islands by the Germans for the duration of World War II to German concentration camps (and the survivers). On the way, we enjoy love stories, mysteries solved, and a non traditional family created involving an eccentric and fascinating cast of characters that one would expect on a small island. 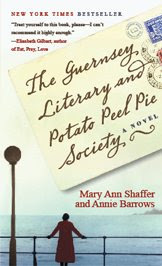 The Guernsey Literary and Potato Peel Pie Society is by Mary Ann Shaffer and Annie Barrows.